Identifying nationally recognized methods for assessing the environmental performance of new buildings in the UK. Most widely used methods include Code for Sustainable Homes (CSH) 2006 and British Research Establishment Environmental Assessment Method (BREEAM). Other methods include Association for Environment Conscious Building (AECB) Silver and Gold and PassivHaus. The City Plan Policy CP8 for Sustainable Buildings supported by Supplementary Planning Documents, SPD 08 – Sustainable Building Design is expected to deliver viable development that considers community aspirations, environmentally sensitive, high quality, adequate infrastructure and helps in mitigating the impacts of climate change by gradually transitioning towards achieving a low carbon economy (NPPF, 2012). National Planning Policy Framework, 2012 expects the local plan policy to play an active role in guiding the development that is viable and sustainable. The principles of One Planet approach have been adopted by the Brighton & Hove City Council which aims at radical reductions in greenhouse gas emissions by reducing energy consumption before the construction and after it is built. Mitigating the impacts of climate change is an important aspect of delivering Sustainable development (Low Carbon Construction, 2010). Her Majesty’s Government proposed Climate Change Act in 2008 which was the world’s first long-term legally binding framework to tackle the dangers of climate change. It include a statutory commitment to reducing the carbon dioxide emissions by 34% by 2020 and 80% by 2050. 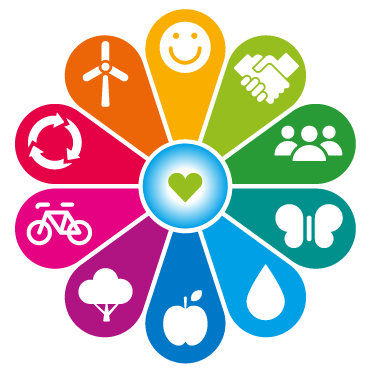 It provides a framework that helps us examine and evaluate the sustainability challenges that we face and develop action plans in order to create a sustainable and healthy environment.